Juat as old(er) age is no barrier to cycling, this post from Cycleiciousness shows that kids can get in on the act as well. A century ago, the ball-bearing was invented. It reduced the coefficient of friction by a factor of a thousand. By applying a well-calibrated ball-bearing between two Neolithic millstones, a man could now grind in a day what took his ancestors a week. The ball-bearing also made possible the bicycle, allowing the wheel — probably the last of the great Neolithic inventions — finally to become useful for self-powered mobility. The ball-bearing signaled a true crisis, a true political choice. It created an option between more freedom in equity and more speed. The bearing is an equally fundamental ingredient of two new types of locomotion, respectively symbolized by the bicycle and the car. The bicycle lifted man’s auto-mobility into a new order, beyond which progress is theoretically not possible. In contrast, the accelerating individual capsule enabled societies to engage in a ritual of progressively paralyzing speed. Bicycles are not only thermodynamically efficient, they are also cheap. With his much lower salary, the Chinese acquires his durable bicycle in a fraction of the working hours an American devotes to the purchase of his obsolescent car. The cost of public utilities needed to facilitate bicycle traffic versus the price of an infrastructure tailored to high speeds is proportionately even less than the price differential of the vehicles used in the two systems. In the bicycle system, engineered roads are necessary only at certain points of dense traffic, and people who live far from the surfaced path are not thereby automatically isolated as they would be if they depended on cars or trains. 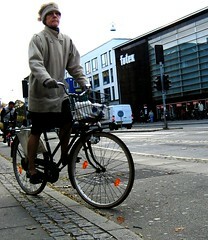 The bicycle has extended man’s radius without shunting him onto roads he cannot walk. Where he cannot ride his bike, he can usually push it. Found on Kent’s Bike blog, which has all the relevant links. A meeting of Darlington Cycling Campaign will take place on Friday 2nd November, starting at 7pm, in The Britannia pub (on the inner ring road, just round the corner from Bondgate (map)). All members are welcome!